It’s been some time now since we introduced you to Florida bluesman Selwyn Birchwood as both the band and Albert King Guitarist winner at the 2013 International Blues Challenge (IBC). Birchwood has of course been keeping quite busy in the meanwhile, having toured the world and put out his 2014 debut album Don’t Call No Ambulance on Chicago’s Alligator Records, which ended up winning a Blues Music Award for Best New Artist Album. 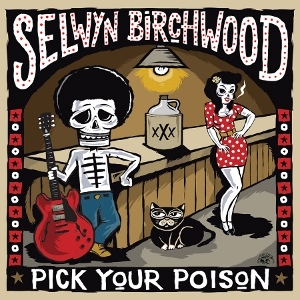 Now, Birchwood and his band are back with the follow-up to that successful debut in Pick Your Poison, an intense, often gritty all-original offering that goes a long way in continuing Birchwood’s trajectory as one of the genre’s fastest rising artists. From the thick Hill Country sounds of the opening, fife and drum-driven “Trial By Fire” and T-Model Ford-ish modern day social commentary “Police State” (“Sayin’ you got the right to remain silent/ Seems they got the right, Lord, to remain violent/ Gotta shake these shackles before it’s too late/ Or we’ll be trapped in a police state”) to the New Orleans gospel of “Even the Saved” with its heavy Robert Randolph-like lap steel (an instrument Birchwood learned from Florida neighbor, Texas bluesman Sonny Rhodes) that has all the oomph of a number from a Blues Brothers movie and a funky, swaying “Are Ya Ready?” that demonstrates Jimi Hendrix’s influence on Birchwood to the smoky jazz ballad “Lost in You”, it doesn’t matter which poison you pick, it’s all pretty potent stuff that, when put together, goes down extremely well and is highly infectious. Birchwood’s deep gritty vocals are well beyond his just over 30 years of existence, with his fiery, frequently stinging guitar work helping to add more of an edge. Combined with his insightful, often clever, lyrics, and a crack three-member backing band made up of drums/percussion, bass, and horns, Birchwood’s music tends to stick a bit closer to the traditional blues than that of contemporaries like Fantastic Negrito or Gary Clark Jr., but is hardly the kind of album you’d put on to relax to, with shades of Hill Country greats such as R.L. Burnside and T-Model Ford as well as recently disbanded Alligator Records labelmates Moreland & Arbuckle. A shuffling, hypnotic number filled with dark horns and ironic lyrics like “I don’t like no whiskey, I just like the taste/ I don’t like no reefer, except every day/ I don’t like the game, I just like to play/ I don’t care for strangers, but I dig the strange”, “Guilty Pleasures” is one of several tracks that includes heavy repetition of the chorus to help draw the listener under its spell, along with, for instance, the funky closing “Corporate Drone”, this decade’s equivalent of the late BB Chung King’s “Company Graveyard”. A bit more irony can be heard on the album’s title track (“it’s the enemy, but I miss it like a best friend”), a swaying, almost rapping tune that includes a blistering guitar solo midway through before ending in a cacophony of horns, as well as on the similarly tempoed “R We Krazy¿” (“I find myself talking to myselves/ They’re the only ones that know the shape I’m in”), a groovy, R&B/soul-flavored number that allows Birchwood to show off the jazzy side of his guitar abilities leading into some delicate horns. The simmering, slow-dragging blues of “Heavy Heart” is filled with blistering guitar, as is also the case with a clever “My Whiskey Loves My Ex” that finds Birchwood “stuck on repeat, repeat, repeat, repeat” and includes a “Bad to the Bone”-like turn in rhythm near its end, with the crawling, country-western strains of “Reaping Time” also worth noting, with its deep horns and storming sound effects. If you haven’t yet checked Birchwood out, Pick Your Poison makes for as good a place to start as any. Here’s a video of the band performing several of the songs off the new album, as well as talking about competing in the IBC, signing with Alligator, how Birchwood became interested in the blues, and more. This entry was posted in Albums and tagged Selwyn Birchwood, Sonny Rhodes. Bookmark the permalink.